If you’ve read my blog for a while, you may know that I have a constant battle with my blood sugar. As a type 2 diabetic, I have to be careful of what I eat. For a while now, my husband and I have stuck with a low carb lifestyle. Briefly we were very strict LCHF followers, then more recently we have gotten a little more lax. One of the things that I have noticed is that I have to keep snacks in my purse for my low blood sugar moments when I’m out on the go. I picked up some Lorissa’s Kitchen snacks at Walmart recently, and I wanted to tell you about them (and give you a chance to win a $100 Walmart Gift Card in their #SavvySnackingSweepstakes…so keep reading to find out how!) You’ll find them right up front by the checkout lanes which is totally convenient and makes it much easier to bypass all the sugary stuff! I often write and work in places other than my home. I go to coffee shops, the library, and sometimes in the borrowed office space at the firm where my husband works. Unfortunately, making good snacking decisions in places like these (or having any access to snacks at all) is limited. When you’re at a coffee shop, often your only options are sugar-loaded pastries or the occasional extremely overpriced “protein box”. Libraries of course don’t offer food, and my husband’s office break room is stocked with things like fun-size candy bars and snack-size bags of potato chips. Not ideal! I can only eat so many almonds before I get tired of them. Cheese is one of my favorite snacks, but unfortunately that requires refrigeration which does not make it very portable. 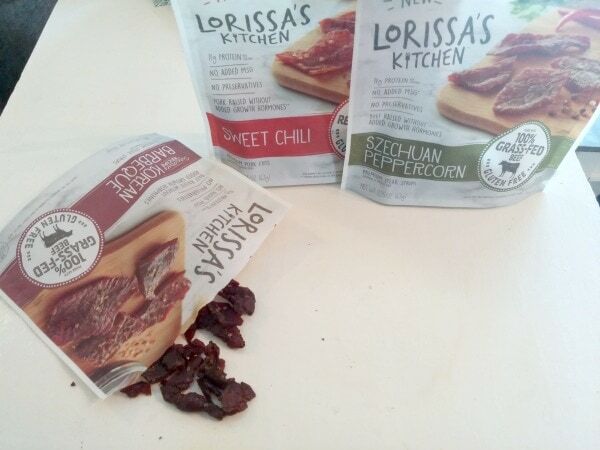 My husband and I were given the opportunity to try Lorissa’s Kitchen products recently and I have to say I am totally hooked! 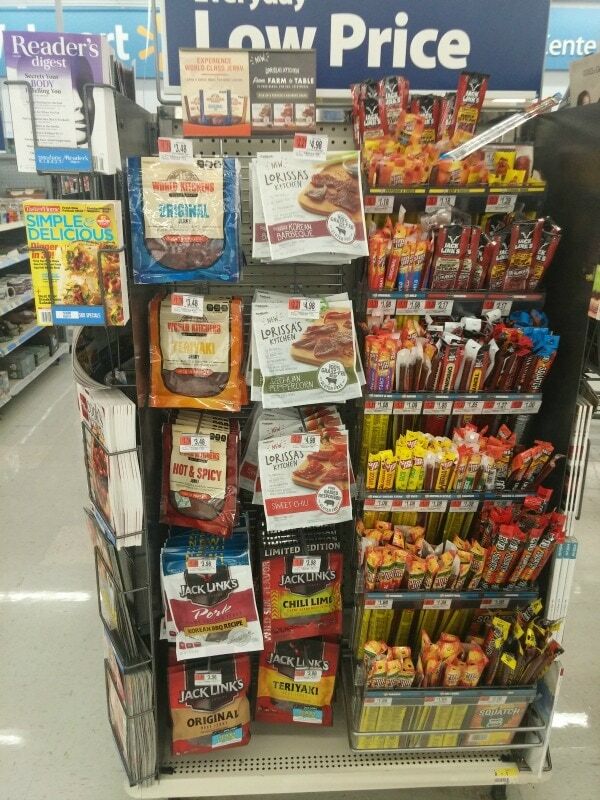 They are NOT jerky, but perfectly seasoned meat snacks with a more tender “bite”. We tried three of the four flavors: Korean Barbeque Beef, Sweet Chili Pork and Sezchuan Peppercorn Beef. All the flavors are amazing and made with 100% Grass-Fed beef and responsibly raised pork. They are the PERFECT on-the go high protein, low carb snack for me (and bonus: they are gluten-free!) I like to carry them in my purse and my husband likes to swipe them to take to the office. He totally swiped my favorite, the Korean Barbeque. But I forgive him, because when I said “Can you at least take a picture of it for me to put in my blog post?” he actually moved the photo of us to include it in the shot. I will just have to go get more! 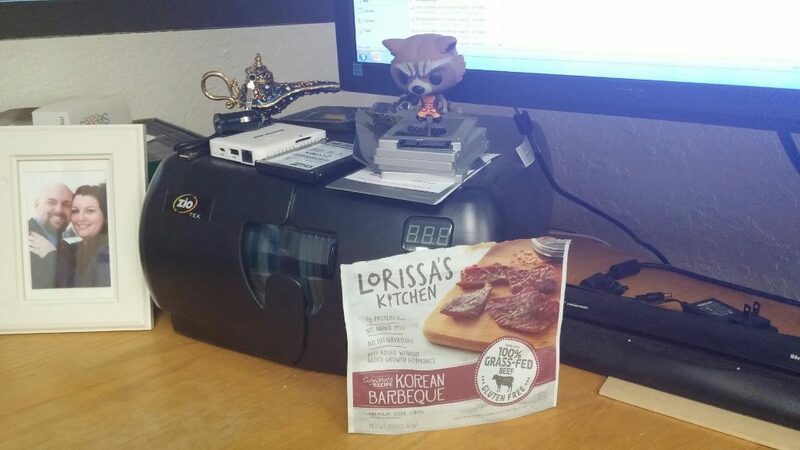 We’re both loving the Lorissa’s Kitchen products because of their “farm to table” philosophy and how they are portable and perfect for snacking on the go. It’s important to them (as well as to us) that we can fuel our day without compromising our dietary requirements. The ingredients are responsible without giving up on taste which is awesome! And now for that giveaway I promised! Lorissa’s Kitchen is hosting a #SavvySnackingSweepstakes and giving away a $100 Walmart gift card to the lucky winners. Get your entries in here, and good luck! I would love it if one of my readers was a winner! 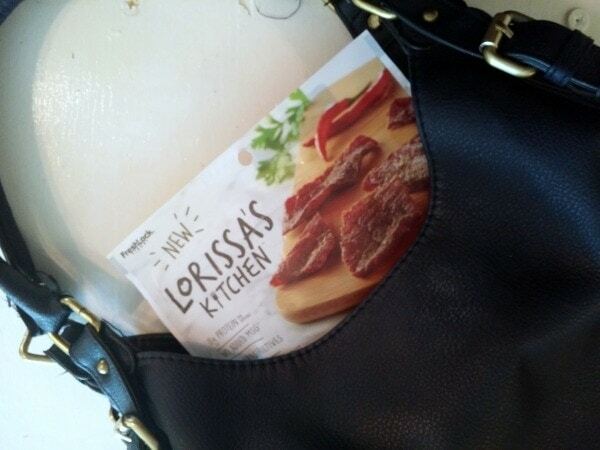 Which flavor of Lorissa’s Kitchen snacks are you most excited to try? Rose these look so delicious and I’m actually excited to try them all! Yummy!!! I wonder about the salt content . I have to be very careful of salt intake.